LOCATION.--Lat 40`48'25", long 75`58'20", Schuylkill County, Hydrologic Unit 02040203, on left bank along State Route 309, 0.6 mi upstream from Tamaqua, and 0.8 mi upstream from Panther Creek. PERIOD OF RECORD.--October 1919 to current year. June 1916 to September 1919, gage heights and discharge measurements only, in reports of Water Supply Commission of Pennsylvania. GAGE.--Water-stage recorder, crest-stage gage, heated tipping bucket precipitation gage, and concrete control. Datum of gage is 817.48 ft above National Geodetic Vertical Datum of 1929. 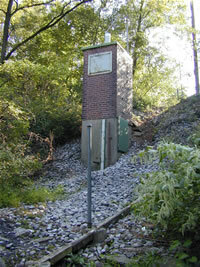 Prior to June 21, 1929, non-recording gage at site 3,600 ft downstream at datum 28.64 ft lower. Satellite telemetry at station. COOPERATION.--Station established and maintained by the U.S. Geological Survey. Funding for the operation of this station is provided by the Pennsylvania Department of Environmental Protection, the U.S. Army Corps of Engineers, Philadelphia District, and the U.S. Geological Survey. REMARKS.--Flow regulated by Still Creek Reservoir (station 01469200) 6.5 mi upstream.